Four years after initially proposed, Metro is finally seeking public comment through June 24 on the Queen Anne trolley restructure it hopes to implement in March 2017. The passing wire at Seattle Pacific has been complete for some time, but Metro needed to budget the small increase in service hours and propose the change as part of the 2017-2018 budget process. Please comment and let Metro know how you use Queen Anne routes. 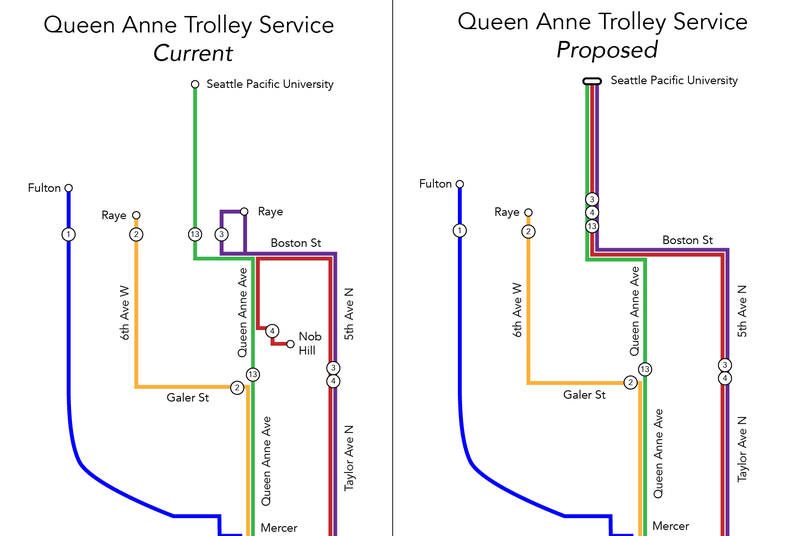 As a refresher, the 5 historic trolley routes on Queen Anne (1, 2, 3, 4, 13) have all had distinct neighborhood terminals for decades, and this restructure seeks to consolidate Routes 3, 4, and 13 into a single terminal at Seattle Pacific University, ending service to the “North Queen Anne” and “East Queen Anne” terminal loops. Triple service between the Queen Anne Business District and Seattle Pacific University (SPU), from 2 buses per hour to 6. Provide operators with 24-hour restroom access, something they currently lack. Atone for the 2012-era loss of Route 17 between Nickerson/SPU and Downtown, restoring frequent combined service to Downtown on Route 3, 4, and 13. End the strange service pattern on Queen Anne Avenue where Downtown service left from opposite sides of the street, with the west side of having Route 13 inbound and Route 4 outbound, and on the east side of the street Route 13 outbound and Route 4 inbound. Require approximately 1% of current riders on the affected routes to walk 2-6 blocks for service, or an estimated 120 riders per day. For instance, the Nob Hill terminus of Route 4 serves just 40 boardings per day. July 6, 7:30 pm, Queen Anne Community Council, Queen Anne Manor, 100 Crockett St.
Route 1 terminates at 10th and Fulton, after looping around a block to change direction. But wire also continues along the south side of the cemetery- past a Metro comfort station, to join the Route 2 wire at its own terminal. While we’re making adjustments- any opportunities here? In the past on weekends they have gone out as the 1 and back as the 2 and vice-versa. I don’t know if they still do this. I imagine the restructure won’t affect this one way or the other since the 1 and 2 aren’t otherwise changing. I’m one of those affected* by the loss of the 4, and I’m all for this. The addition of frequent service up the north side of the hill makes up for the extra walk. I do know some of the people that may fight this though. People living in that same 5th ave housing with children that attend John Hay elementary. Those extra 6 blocks don’t sound as short when you’re walking uphill with a kindergartner. That said, it’s still just 6 blocks. * well, mildly. it’s not part of my commute, and I have the 2. The six blocks probably assumes you take the same bus. This looks like the shortest route, which would involve either a 2 or 13: https://goo.gl/maps/HXZmKG7R3eM2. This is (from my estimation) the easiest route, involving the 13: https://goo.gl/maps/si9cXhaDQJA2. Either way, though, it doesn’t seem too bad (certainly not for Queen Anne). My son went to Hay when it was an alternative school (an all city draw). He took a school bus, like most kids. Even if it has changed to a neighborhood school, I doubt very many take Metro with their kid and walk to school. It could happen (maybe mom is on her way to work and catches the bus after dropping the kid off) and if so, this will cost her a few minutes (on the other hand, the consolidation might save her a bit on the other end). It is inconvenient once in a while, if you want to take the bus for parent teacher conferences and the like, but that is a pretty minor problem. The only people in the school that might complain are staff, who have a longer walk now. My guess is they won’t raise too much of a stink, though. People who work in schools tend to be “greater good” type folks. I think the “six blocks” was talking about people who live on Taylor/Fifth who’re currently taking the 4 around the loop to school. This change will definitely be a loss for them, but I think it’s still worth it for the new SPU connection – especially given, as you say, I don’t think that many people are currently doing that. You’ll notice the walk boundaries are all the way to Aurora and Roy. Yellow bus service is generally not provided within this boundary. A 1 mile walk uphill with a kindergartner is certainly possible, but surely not an attractive option for most. Hence the long line of cars dropping off in the morning. Again, I’m in favor of this change. I’m just identifying those that would miss the 4. Fair enough. So those folks have an additional six block walk (which is very steep) or a two seat ride followed by a three block walk. Yeah, definitely a degradation. But if the kid (or more likely the parent) can’t handle the former, then the latter doesn’t sound horrible. At least they have the option for a minimal walk (and the transfer doesn’t sound that bad). I could easily see taking the transfer on the way there, and walking down the hill on the way back. OMG, those existing routes are insane. ‘Eh, they were sane enough when the wire was strung. Times have changed. Yep, they closed Queen Anne High School. The loop of the 4 made a lot of sense back in the day. You could pick up plenty of students and them deliver right to the top of the hill, where the school is. As you say, times change. Another question, though. Why is it that when these lines were electrified, single-family neighborhoods had merited so much wire? From my early transit-oriented days in Chicago, I’ve never really been satisfied with single-minded insistence that lawns and yards kill transit. https://www.flickr.com/photos/43315334@N07/26573066986/ Yeah, it’s an Electroliner. All I care about are the houses and the wire and tracks. Really serious details are the 1960 Plymouth and the 1961 Chevy. which you could see better if the Electroliner wasn’t in the way of it. You know, maybe we could improve our chances for a Heritage line, Benson cars and all, if line included whole blocks with parking exclusively for classic cars. Still think that even GM and Chrysler (do they have Plymouths anymore?) thought that transit would continue to keep traffic clear for their cars. When cars were still one per family or less, easy to assume that the wife would always take transit to shop, while the husband, naturally, took the car to work. Or that he commuted by “L” too, leaving the car to take the kids and the dog to the country. Wonder if 3 and 4 part of same idea? The electroliner was an intercity train though, operating from Milwaukee to Chicago. It ran in city streets where it needed to. You could just as well ask why the tiny city of Rainier is justified in having millions of gallons of oil in its street: just because that is where the tracks are doesn’t mean that is the ultimate destination of the train that runs there. Last comment, only used pic to illustrate that I don’t think single family homes or duplexes don’t dilute density enough to damage transit. As part of question as to why Queen Anne neighborhoods were trolley-wired in the first place. And the Route 14 too. Above was common scene in cities up through the 1950’s. Also like its pedigree: St. Louis Car Company. Which after upcoming sequel to the hair raising zombie-apocalypse titled “Crash of 2008”, the Feds should bail out and rebuild instead of either GM or the banking system. And even more, spirit. This was the interurban railway industry’s last and hardest fight to survive as the average Chicagoan and Milwaukee-an got a car. Same spirit as starting an electric railway with trolleybuses. Head for where you need to go, with what you already know, as fast and far as you can. While remembering that while Bellevue might go for LINK baggage cars for organic groceries, mall purchases and lawn-tractor parts, oil trains will cause ugly meetings and a lot nastier signs in Kirkland. The supports were already there; streetcars were converted to trolley buses, not diesels, in most instances. Will have to admit, my own neighborhood in Chicago had mix of different building sizes, And the ones on the Milwaukee car-line probably held two families each. Though lines also went through poorer neighborhoods with a lot of free standing homes. Though owners had much larger single families. But still nothing like density demanded here for transit. But come on! When the school built- no matter how many kids slept in algebra class- it was school was nowhere near yet multifamily residential. Definitely right that by far biggest dislocation wasn’t density of people so much as the cars they could increasingly afford to own. Which now persuade their owners to bring transit back because they hate having their motors, transmissions, and brakes eaten by stop and go driving and idling while stuck. Buy be prepared: that Route 4 loop could be on the Historic Register! I think you answered it. I’m sure when those routes were designed (several generations ago) there were more people and fewer cars per household on Queen Anne, and a greater share of routine activities for Queen Anne residents lay along the line. People were less likely to work in Redmond or Eastgate, less likely to shop in Interbay, less likely to ski or hike routinely, less likely to have kids’ activities at Magsuson Park, more likely to trust their kids to ride the bus alone. Cars were more expensive to own and operate compared to income. Yeah, I agree. In general the little curl of the 4 made a lot of sense when the high school was there, and few drove to it. The turnaround for the 3 is a little harder to see, but my guess is that the lines were simply built in order. First you had the counter balance, but as soon as they started laying wire, it went 1, 2, 3. There was probably a gap before they added the 4 (1, 2 and 3 together have pretty good coverage). The 4 was added because of demand for service to the high school, and the two tails are fairly far apart. Finally, the 13 came in, and made the 3 look redundant. Then the high school closed and we’ve had this for a while. It took them a long time to change this, but I can see why. It costs money to move wire (even to just take it out) and folks often object to change. Metro has also had to deal with much bigger changes in the region over the years (entire neighborhoods grew up and they had to figure out how to serve them). This just got put on the back burner, and finally is being done. The 1915 map of Seattle street railways has the lines doing something very similar, only with a wye and set of stub end tracks. The 1896 map shows no Queen Anne lines yet. In any event, the lines have been doing what they do from a time when things were vastly different. They did not “lay wire” for the trolley bus network in route number order. The first route to open was the 13-19th Avenue (now the 12) in 1940. Other routes opened as the overhead construction finished. The route numbers all changed when the system moved from streetcar to trolleybus during the conversion. Both the East Queen Anne and North Queen Anne terminals have existed, as Glenn in Portland noted, for over 100 years, going back to the streetcars. They were convenient places to turn the cars around. I suspect 100 years ago the grade coming up 3rd Ave W was not as gentle and smooth as it is now. Additionally, these were all (private) Stone and Webster developed lines, where as the Nickerson Street streetcar line was opened by the city, which would have required sharing infrastructure on Nickerson Street (I believe it also, for a while, was a “two pole” streetcar). Thanks K H, I appreciate the correction (my theory sounded good though, you gotta admit :)). Families were also larger, 2+ kids was the norm. And the one-bedroom apartments were full of families with kids; they didn’t insist on a house like they do now. And it wasn’t until the 1960s that families had more than one car (except the occasional teenager that saved up for one). Why did they need turning wyes for the cars there? Most any operation I can think of in that era had double ended cars. routes 3 and 4 became electric trolleybus in 1940 when they replaced the streetcars that were torn up. It seems no planning was conducted; it was a one-for-one replacement. The streetcars were probably installed to develop the land and were oriented to downtown Seattle via the streetcar grade of Taylor Avenue North. Queen Anne Avenue North was served by the counterbalance. eddiew – While the streetcar to bus conversion in 1940 replicated, for the most part, the former streetcar routes as either trolleybus or motor coach routes, there were some changes. For instance, Ballard service on 24th Ave NW and 32nd Ave NW was very different under the 1940+ system than what existed under the streetcar network. The level of service through Queen Anne on Sundays is a big disappointment for so close to the center of town, and, sadly, it doesn’t look like the restructure is going to make things any better. As a refresher, the 1 runs every 30 minutes, the 2 and 13 each run once an hour, with 30-minute service on the combined section, while the 3 and 4 are combined into a single route with a crazy “dog bone” terminal every 30 minutes. I guess the restructure will at least eliminate the “dog bone” terminal of the Sunday route 4, but these are still extremely low frequencies of service for routes that are so close to the middle of the city. One would at least expect the 3/4 and 2/13 to have 15-minute service, rather than 30-minute service in the combined corridors. One glaring whole in the Queen Anne trolley network is the lack of a connection to Fremont, thereby requiring a separate route (the 32) to connect Seattle Center to Fremont by duplicating the D-line through Interbay. If the trolley wire could just extend another few blocks, route 13 could be extended to Fremont, allowing route 32 to be truncated at Fremont. This would free up some service hours for a more frequent route 13, as well as finally providing a connection between upper Queen Anne and at least one activity center to the north. (While the one-seat ride from Seattle Center to the U-district would be lost, I don’t think many people would notice – it’s a very slow one-seat ride, and going downtown and riding Link is usually faster, and certainly a lot more frequent). They’re actually doing it? Wonderful! The 13 runs every 30 minutes on Sundays between 10am and 10pm. The 2 also runs every 30 minutes. Ah, I missed that. That’s better then. (That’s what I get for not scrolling down in the schedule page past the 8 AM trips). Still, though, a route 13, running every 15 minutes, extended to Fremont, definitely beats a route 13 and 32, each every 30 minutes. I wonder how the extended route 13 will use as its turnaround loop. The locations of the bus stops at Fremont/34th make it somewhat tricky. One option could be to run the route northwards to the Woodland Park Zoo, and have the bus layover and turn around in the zoo parking lot. This would fill the upper Fremont->lower Fremont hole in the service, as well as provide some additional connections, such as making most of Queen Anne now a 2-seat ride away from anywhere served by routes 5 or 44. Yeah, the turnaround spot (or where to go after you cross the Fremont bridge) is an interesting question. I had the same thought as you — just head straight up Fremont. There is often congestion there, but it is tough to avoid it in general. The best bet in that regard would probably be to head west on Leary, then maybe turn around on 40th and 3rd. That means a sharp turn (not that again) but otherwise seems like a fine spot (there is layover space on 40th — https://goo.gl/maps/zSEFi8sWmuT2). But that doesn’t provide nearly as much functionality as a bus running straight up Fremont. As many know, I’m a huge proponent of the Ballard to UW subway. But in the meantime, Seattle has proposed a major improvement on that corridor (the 44). You can only do so much (there are some major intersections to cross, and very complicated congested areas) but if they do anything close to what they are doing on Madison, then it would be a major improvement. From the U-District to Fremont, I would sometimes take the 44, instead of the 31/32, just because it comes so much more often. But between the walk down the hill, and the slow speed of the 44, it cost me a fair amount of time. But if a 44 BRT gets both higher frequency as well as much faster speed, then it is a very solid option. Run a frequent 13 down Fremont, and it changes everything. Suddenly a two seat ride from the U-District starts looking good (as it would if the Ballard to UW line was built). Meanwhile, what about the 32? Right now the 31 and 32 provide a great connection from the UW to Fremont to SPU. Even with the transfer I mentioned, the first part of that route (UW to Fremont) seems like it is essential. From lower campus to lower Fremont would require a three seat ride otherwise. Meanwhile, the SPU to Fremont part is replaced by the 13. The rest of the 32 doesn’t seem essential, or likely even that popular (I’m sure a lot of people grab the 32 when it happens to come before the bus they were waiting for, like the D). But the 31 is a different animal — it provides a connection from Magnolia to SPU to the U-District. I don’t think you would want to lose that. So one option would be to just run it twice as often. I have a hard time seeing that much demand for that part of the route, though (especially once the 13 is extended). You could truncate it, but I don’t think that translates into any savings (since the 31 and 32 have to be synchronized). So how about running the 31 up Leary and then 8th. This doubles up the 28 from Fremont up to 8th. In terms of time spent, it seems a good match. I would think the 31/32 could be reasonably reorganized so that one of the loops made by the 24 is replaced by the 32. That gets into a Magnolia restructure though. 1) Extend the 13 up Fremont Ave. to 50th and use the Woodland Park Zoo parking lot as a turnaround loop. 2) Truncate the 32 at SPU, using the current terminal of the 13. 3) Re-invest the savings of truncating the 32 by making the Fremont->U-district corridor a full-time frequent route – including evenings and Sundays, which currently have a half-hourly 32 and no 31 at all. If budget doesn’t allow for operating the 31 on evenings and Sundays, Metro could at least run the truncated 32 during those times, allowing for frequent service on the most important part. It’d be kinda nice to try to reduce some of the congestion in the Discovery Park parking lots on the weekend though, and it would be nice to have something other than the 33 to do that. Maybe at least try it for a summer quarter and see how popular it is? Another possible good 32 destination might be somewhere in Ballard. That links the north end of Queen Anne to the D and 15 as well as providing a bit of an alternative routing than the 44. I’m not sure it should go all the way to the locks but at least the core area of Ballard might be good. Bad news is putting two draw spans on a single route. >> 2) Truncate the 32 at SPU, using the current terminal of the 13. I’m not sure if there would be any savings. That is what I was getting at earlier (I want to truncate as well, but I don’t think it gets us anything). The 32 and 31 have to be synchronized. If the 31 runs by Fremont at 2:15, the 32 should go by at 2:30. That means the 32 would just be sitting at SPU for a while, or going somewhere else (e. g. deadheading for a while). I don’t see it. >> I would think the 31/32 could be reasonably reorganized so that one of the loops made by the 24 is replaced by the 32. That could work, but only if parts of Magnolia live without a one seat ride to downtown. [Note: If you are trying to follow along, this helps a lot: http://seattletransitmap.com/app/%5D. Looking at the geometry a bit, the only option I could see is running the 32 out Gilman, then south on 34th, then around to Viewmont. Now the 24 could be truncated at Government Way. Better yet, run the 24 into Discovery Park, and truncate the 33 at 31st. The 33 runs by the most apartments, but it is diluted by the trip into the park. If you truncate it, then you can add service along the efficient part, and have a pretty solid improvement. >> It’d be kinda nice to try to reduce some of the congestion in the Discovery Park parking lots on the weekend though, and it would be nice to have something other than the 33 to do that. Worth noting is that the 24 also serves the park, just a different part of it. Anyway, this is all sounding familiar. It is all very similar to what was proposed for a Magnolia restructure a while ago. I think there was push back from Magnolia folks who didn’t want to transfer to get downtown (even in the middle of the day). 2) Send the 32 onto Leary, then up 8th NW as far as you can. Hopefully this will be synchronized with the 28, giving the Fremont to west Greenwood connection more frequency. 3) Run the 29 all day, hopefully synchronized with the 31. That gives SPU students a one seat ride to Ballard, and a frequent connection to the ‘D’ (via the 29 and 31). 4) Have the Queen Anne part of the 2 follow the 13 route all the way. Basically there would be no Queen Anne 2 (only the 13). That part of Queen Anne is served by the all day 29. About the only hit you take is UW to SPU. But that isn’t that bad. You have simply eliminated half the one seat rides, while the two seat rides are not bad. The new 13 should run fairly often, and so does the 31/32. They will have another way to get there, as well (stay on the 13 until you cross 45th, then take the very frequent 44). Of course, I haven’t done the math to see if this would all pencil out, but I see it as an improvement. The 2012 proposal merged the 2 into the 13. That would have given full-time frequent service along Queen Anne Avenue, which is the commercial center, density center, and geographical center of the neighborhood. But 6th Ave W partisans objected to it. The whole thing went down because of the other half of the 2, where partisans on Seneca Street and Madrona didn’t want any moving or splitting of the route. They were the loudest status-quo advocates in Seattle (the #12 19th Avenue partisans were second), so Metro backed away. Metro didn’t promise to keep the status quo forever; it just moved it out of the RapidRide C/D restructure. Wow, nice. The next step IMHO is consolidating the 2 into the 13. For most people a doubling of frequency would be great – the furthest stop would be a 7 minute walk away, and those users get a 7.5 average wait time boost. All other riders just get better trips. I wonder if it makes sense to shift a little service over to the 29 in the process. Run it all day (half hour). That way someone could take the half hour bus that gets them close, or the more frequent bus. You would have to get some service hours from somewhere, and it would likely come from the 2/13. That means it might not run every 7 1/2 minutes, but every 10 minutes maybe. Either way it seems like that would be a very good trade-off. The 29 provides coverage as well as a nice connection between Ballard and Queen Anne, while the 13 runs a lot more often. You could also be more aggressive, and end the new 29 at Queen Anne Avenue. That would probably give you plenty of service hours, giving you back that 7 1/2 frequency on the 2/13. Someone from the 6th Avenue part of that route would have a two seat ride to downtown, but those are likely the only folks riding that downtown (there are other options for getting downtown on the rest of the line). The 1 & 2 would live-loop in downtown: an inbound 1 would turnback at Main St. and go back to QA as Route 2 and then reverse the pattern (inbound as Rt 2/outbound as Rt 1). The 13, still on the Counterbalance but running every 15 minutes, would thru-route with the 3S/4S. The 3N/4N, running on Taylor but with 20 minute headways, would thru-route with the 14. Ideally, 3N/4N should get 15 minute service which might be possible if it were thru-routed with the 36 instead of the 14. Actually, even simpler: the 8 buses per hour inbound from 3S/4S would all end up at SPU with trips alternating via Seattle Center West (route 13) and Seattle Center East (route 3). The 14 would then turn back in downtown Seattle. The 2S would also live-loop in downtown. As someone who rides a bus from Queen Anne to downtown twice a day, I’m hugely in support of this restructure! Not only will it increase connectivity to Seattle Pacific, but it will enable me to use the 3/4 to go to downtown. As they currently dead end on the north end of the hill, the restructure would have the 3/4 continue onto Boston, which means that residents on the west side of the hill could use them as well. I’d lose ~7 minutes every AM because of walking further. In the PM I usually took whatever 3/4/13 was coming first. I’d gain from the 4N running 1 block further north, but lose 2 blocks from the 3N turning at McGraw. Net loss of ~2 minutes a day on average. Overall this is not a huge change but I’m an able bodied guy so the extra walking is manageable. An older person who has to walk up the hills and now an additional 2-3 blocks is not going to have such an easy time of it. Will the SB stop on Queen Anne Avenue between McGraw and Boston (by Pizza Hut) be retained? Even though Boston is 1 block away, retaining that stop would be nice for people coming from the old 3N walkshed. Why would that stop go away? The routing to SPU from Queen Anne Avenue is not on Boston, but on McGraw, the next street north. The route 3 and the 4 having separate terminals in the north end is crazy, but in the south end it makes sense? Sam, someone who’s followed the blog as long as you should know that we’ve been pushing to combine the 3/4 terminals there too. I think it is a tougher trade-off, too. As with any change, with this one you lose something. You have a couple of extra blocks worth of walking, and getting from 5th/Taylor to Queen Anne Avenue requires a transfer. At the same, time, though you gain a one seat ride from 5th/Taylor to SPU. That seems like a great trade, and one most people would take. So you gain a better connection overall, while asking people to walk a couple blocks. On the other hand, I’m not sure how you would combine the 3 and 4, but it doesn’t seem like it would be as obviously beneficial. From the split, there is no obvious destination (like SPU). You could head south, to Mount Baker, but there really isn’t anything more appealing there. You have a connection to more transit, but for the most part, you had that way back at Garfield (or First Hill, if that is where you started). Meanwhile, you would require more walking for someone (as you do with this change) I just don’t see the big gain that this one has. Not that I’m opposed to looking. If we can save service hours, and put them to good use, I’m all ears. The obvious hole in the Central Area is 15th. A bus that connected Group Health with Swedish Cherry Hill and kept going to Jackson would be really nice. That would make sense as the Madison BRT comes on board, and fewer buses make the turn onto it (I would kill the 12 and replace it with that bus). But that is a different subject — although probably when we should consider changes to the 3 and 4 since that will shake up the area. In Soviet Union, blog reads you. The 2012 restructure also proposed to merge the 4S into the 3S. That got a small amount of opposition from status-quo advocates, particularly around a blind-services? facility at the terminus. Neighbors of the facility seemed more opposed than the facility itself was. The counterargument is that the 4S has no unique segment; all of it is along the 3S and 48, and the southernmost part is close to the 7. And the 4 is so incredibly slow on James Street and Jefferson Street that not many people ride it out to the end. Whereas the 3S serves a distinct area, and one that has been underserved by transit. The 3S and the 4S end over a mile from each other and they split in opposite directions. Combining them (essentially eliminating the 4s branch) has its challenges. Ironically, the 4S gets a boost in 2023 when the 23rd Ave entrance to Judkins Park Station opens. It will become a great direct route to hospitals like Swedish Cherry Hill and even Harborview and East Link – if that tail still exists. Note the meeting at the Queen Anne Community Council is 2 weeks after the comment period ends. Maybe when/if this happens, Metro will be able to fix a small nit: Update the headsigns on buses in the CD to show which ones actually go to Queen Anne. Route 4 usually does this (most trips say “E Queen Anne via Seattle Center E” and some say “Downtown Only”) but 3 either says “Downtown via E Jefferson St” or “Downtown Only.” The former means the bus is going to Queen Anne but it might take either the route 3 or route 4 routing once it gets past downtown. Once all (3, 4, and 13) routes go to the same terminal, hopefully the “will it turn into a route 3 or 4 or 13 at 5th Ave” question goes away so they can have consistent signage. The buses were signed, for years, to their ultimate terminal on the 3/4 in both directions. The way the OBS radio system works, however, makes it extremely difficult to set the signs correctly, automatically for the ultimate terminal. This is because if you have a 3 that becomes a 4 (or the reverse) they have to be listed on the operators run cards as separate trips. The system seems to have a problem with recognize what the “next” terminal for the trip is on the run card to assign the correct signage. Thus, the buses are signed to the Downtown terminal, and then change to the following terminal, en route. For instance, a bus from 25/Walker to 3rd W/Raye is a 4->3. Before the automatically changing signs, that bus would leave as a “4 N Queen Anne Via Downtown” and change at 5/James to “3 N Queen Anne Via Sea Ctr E.” This corresponds to the next trip on the run card (which actually starts at Pike, or thereabouts). However, with the OBS system, the system reads the run card as a 4 to 3rd/Pike (4 Downtown). And then looks for the next trip at 5/James (sign trigger point) and sees a 3 N Queen Anne, and changes signs appropriately. It cannot differentiate on the inbound trip between a trip continuing as a 3, or a 4, for signage purposes (Note the “Downtown Only” trips terminate at 2/Lenora, so the system can be programmed such that those trips display that specific signage). This was a problem, at one time, for the 48. The 48 had, for time eternal, been separated on the runcards into two trips… the 48N and the 48S. At 15th/45th, the in each direction, the operator would reset the farebox to recognize the next trip. Drivers were instructed in The Book, when they set signage manually, to sign the bus for the ultimate terminal, or the second trip. When the OBS system was initiated, all of a sudden all the 48 trips leaving from Loyal Hts were signed as “48 U District.” You’d have to ask the operator if this was a Columbia City or Rainier Beach trip if you boarded in the north end. The next shakeup they revised the run cards so that the entire length of the route was a single trip, and signage began displaying correctly again (the ultimate terminal). Thanks for the in depth explanation; I love figuring out more of the idiosyncrasies of this system. You’ve also covered why I hope it won’t be a problem after the change. Routes 3 and 4 will go, collectively, to four places: Judkins Park, Madrona, Queen Anne/Seattle Pacific University, and Downtown. They should be able to keep on the same route number both away from the ship canal (a 4 southbound is always either “4 JUDKINS PARK VIA 23RD” or “4 DOWNTOWN ONLY”) and towards it (a 3 northbound is always either “3 DOWNTOWN ONLY” or “3 SEATTLE PACIFIC UNIV”). I will also take this opportunity to e-mail Metro and ask for an extra trip from QA/SPU to at least First Hill between the 12:15am and 1:10am trips that already exist. An hour gap is a real kick in the teeth, especially if the 545 inbound is running a few minutes late. The obvious solution is abandon the silly practice of having every bus change numbers when they go through downtown. Just have one route number for each unique origin-destination pair, and try to minimize the number of those unique pairs. That would require changing the numbers whenever Metro reconnects the halves to balance ridership. The 1/36, 12/13 and 14/47 used to be connected. Now the 1 is connected to the 14, the 13 to the 3S or 4S I think, the 47 is isolated, I think the 12 is isolated, and for a time the 10/12 were connected, as well as the 11/125. Should Madison Park lose its familiar number because it’s no longer through-routed with South Seattle College? Metro has been gradually changing numbers as it splits routes or reconnects them. I think the 2 has remained because it was never unbalanced enough to require a split. The 3 and 4 supposedly for the same reason, but the other comments show this has become problematic with some 3S or 4S terminating downtown, turning into the opposite number, or turning into the 13. So that may be a case where it’s high time to split the numbering. That’s how Vancouver was organized for many years. It is and has been a mess. The Metro system is better. I will play devil’s advocate a bit here though, specifically on the suggestion above to combine the 2 and the 13. The “fewer lines that run more consistently” thing makes a lot of sense, but it’s worth remembering that QA is a giant hill that is wicked steep in a lot of places. I don’t mind huffing it, but a lot of people might. I live near the 1 but often walk up the hill to grab the 2 so I can have a one-seat ride to Cap Hill. It’s doable, but if I had to huff all the way to QA Ave. to grab the 2/13 I might not do it as much. One has to to ask, though, why someone who can’t walk up a couple flights of stairs would choose to live in Queen Anne, in the first place. Certainly, not for cheap rent. I am not familiar too much with local travel markets – but I have to wonder why the northern terminus does not tie into Rapidride’s D or E. I understand that there are other RapidRide transfer points but it seems empty to stop at a place with frequent service that is 1/2 to 3/4 of a mile from another high frequency and faster-moving RapidRide bus. The problem mostly comes down to geography. 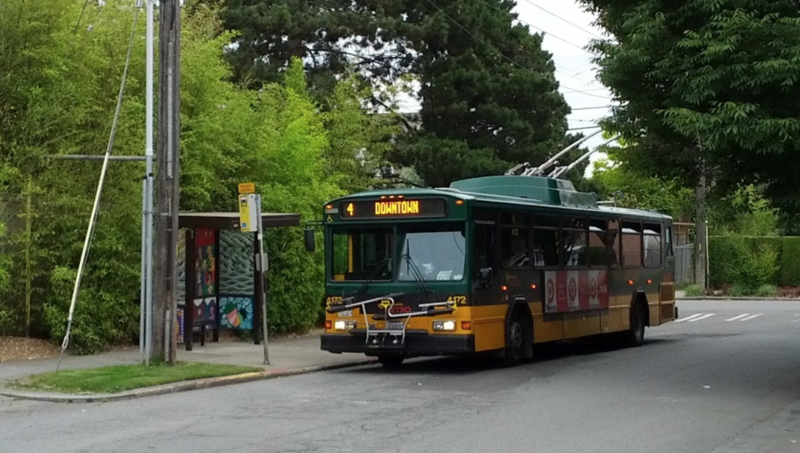 The D goes on 15th; there aren’t any streets the bus could go on from upper Queen Anne to 15th. On the north side of the hill (where SPU is) the D is already on the Ballard bridge so it doesn’t really make sense for the 13 to backtrack south (to where 15th is at grade) when it could go north into Fremont. As for the E, it’s simply too far east. If/when the 13 is extended into Fremont it wouldn’t make any sense for it to immediately head east to Aurora when it could instead hit the dense parts of Fremont. In any case, people on Queen Anne needing to go to Ballard can either walk down to 15th or (soon) take the 13 to Fremont and then transfer. Those going to the Aurora corridor would have to backtrack to downtown, but I really don’t think there are that many people going from Queen Anne to the E line. The E Line stop nearest Fremont isn’t mostly east from the dense part, it’s mostly north. If the 13 ran up Fremont Ave as far as 46th I’d use it to connect to the E Line there (I think that’s better than taking the 62 south and connecting at Crockett/Lynn — I don’t like walking across the Aurora interchange on 46th but I’ve done it enough times that I know where to look for oblivious drivers). If the 13 eventually makes it to 46th & Fremont, the transfer to the E northbound there isn’t exactly pedestrian-friendly, but it is short. Take the 13 up Fremont Ave N to the zoo and have a transfer point between the E and 13 at the rose garden/west side of Aurora. I emailed in a supportive comment and got a response already! The metro planner answered my questions and thanked me for my support. Excellent. This looks like a great change. I’m glad it is happening. I can’t find the proposal on Metro’s website and the links in the STB article lead to older articles. I’d like to know a few more details (frequency, span of service, etc.) before making comments. Anybody have a link to more info? Anadakos, I really didn’t know that present trolley bus route were once run with streetcars. Thanks for the clarification, but no surprise. Probably did same for cable cars. An electric motor will pull a lot more weight uphill from a standing start than any combustion engine. Don’t know about steam. Not advocating that, but always liked whistles better than horns. Especially from those giant compound locomotives with more driving wheels than average train had wheels. Might work better than signal pre-empt, and reserve its own lanes without any signs or stripes. As usual, a lot of what I’m saying about route revision here is overacting to make a point. I think the complete de-transitizing of every arterial besides Third through the Regrade is overkill. Will be good to get the Connector streetcar line on First, but shouldn’t have had to wait years. Might check out overhead in place uphill from first running Cherry to Second to James toward -maybe not to- Third. This wire was part of a Downtown Seattle Transit Project effort to take passengers directly from the Colman dock walkway to the Courthouse. About the time Pioneer Square got connected to the whole Waterfront by something else expensive that got trashed and thrown away. In a way, kind of glad Metro decided to shelve plans to wire and ramp the Route 7 from the DSTT to Rainier at Dearborn. Wouldn’t grieve the eventual loss of it when LINK went all-rail. But couldn’t have stood seeing it crumbling behind barrels and barriers for 25 years when it got dumped halfway through. Certainly won’t fight Queen Anne revisions. But would definitely have asked my Federal reps to take back their money when the streetcars was Disappeared. Child needs to learn early you don’t throw presents into the trash or food on the floor. I’m curious if when this is implemented the 3N/4N will get their own number, since they’re the same route. Perhaps 6? They could still through route them with the 3S/4S, but it’d increase legibility. Plus it’d make it clear that this ain’t your Grandma’s 3N. I’m fairly certain the whole thing will be the 3. Unlikely to see the 6 resurrected. Well that’d work if they consolidated the 3S & 4S, but if they didn’t they’d be left with a 3 that either stays a 3 when it gets to downtown or changes over to a 4 when it hits downtown. If its numbered as the 6 (or some other number) the 6 portion serves Queen Anne, and the 3 & 4 serve Madrona and Judkins park. Its an increase for legibility, and if Metro is going to do it, this’d be the time. Good idea, NIck. What you are proposing makes sense. But then again, folks in that area are probably used to the idea of a 3 becoming a 3 or 4, since the 2 becomes a 2 or 13.
actually I would use the number 34 as the new Queen Anne portion of the 3 and 4 (get it?). You will never see the “6” number used, though it was never directly related to the Aurora Bridge incident (even the now “49” was originally numbered “6”, but nixed by someone at KC Metro). Having different numbers for tails for trolley routes would be good, for future thru-route capability, without having to have different tails of the same route. Warren, 34 would be a reasonable number, but 43 has a better ring to it, and Metro barely uses that number anymore. Why can’t Metro use branches for name of routes that interline like other transit systems? Like Rte. 3/3A/3B, etc. 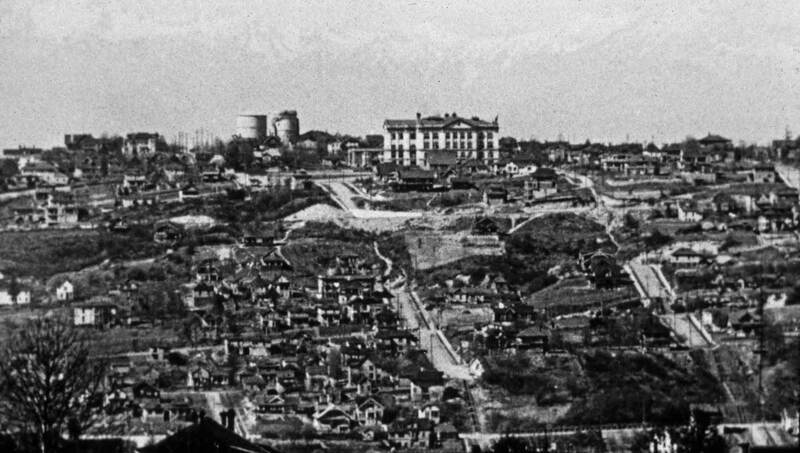 According to George Hilton’s The Cable Car in America (1984), The Front Street Cable Railway first climbed Queen Anne Hill in 1891 along Front, Second, Aloha and Queen Anne Avenue. It was converted to electric streetcar in 1900 by Seattle Electric, which used a counterbalance on Queen Anne between Mercer and Galer Streets. Then the streetcar line became the trolley bus line(s) everyone knows. So that’s why Onebusaway says the 2 headed downtown is headed to Madrina?